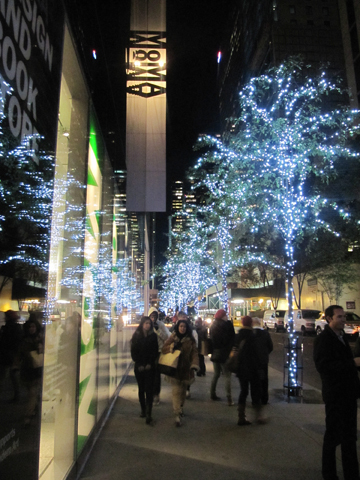 > Atelier Circulaire and Friends Visit New York. En route to New York with Isabelle and Mustafa to the right. 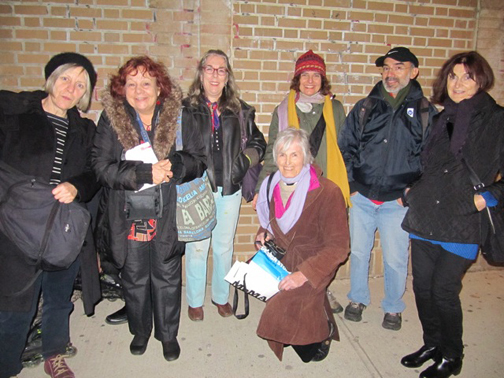 On Friday November 8, 2013, at 4:00 a.m. 21 artists, from three different printmaking studios hopped on a bus and cruised to New York to visit the IFPDA Print Fair. Atelier Circulaire, Zocalo, and Atelier de l’Île members shared an unforgettable three-day art adventure. Part of our group after breakfast on the road at Golden Corral. 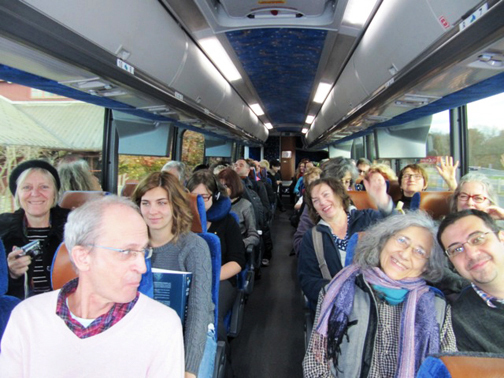 Isabelle Desjardins, Mustafa Hacalaki and I organized the trip. We chose to work with Tourika, for their affordable rates, sound reputation, and their professional approach. 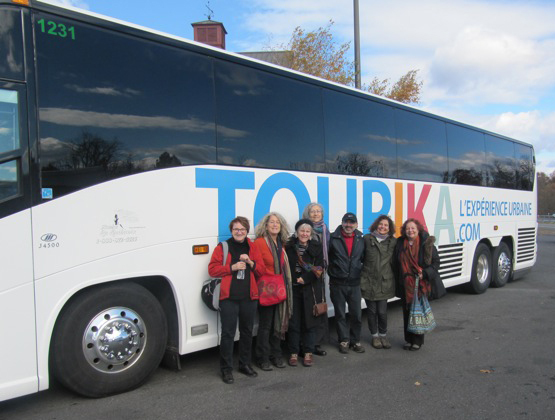 Tourika reserved the first half of the bus for our group and the rest for their other clients. 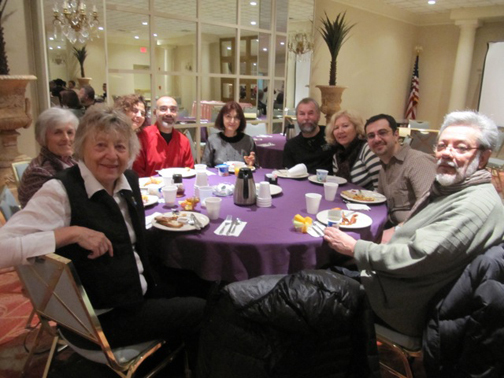 Our Liberty package, included transportation between the two cities, rooms at the Holiday Inn, in Carteret, New Jersey, transportation each day to and from the hotel and Manhattan, as well as buffet breakfasts. Our first destination was the IFPDA Print Fair. We were ecstatic as we perused aisle after aisle of delectable prints, like kids let loose in an all-you-can-candy store. 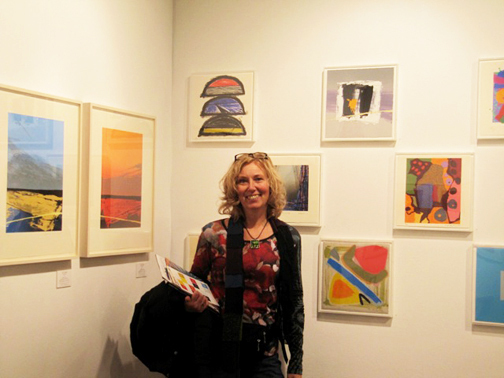 I cover the event in my blog, Talleen’s Picks at the 2013 IFPDA Print Fair. After this extraordinary visit, artists were free to explore the Big Apple in smaller groups, before meeting on 49th Street to take the Tourika bus back to the hotel at 8:00 p.m.. My husband, Diego, and I went to MoMA for the Magritte exhibit, had our mandatory dose of New York Pizza topped with all those condiments in all those shakers, and caught a 10:15 New Jersey Transit bus from Port Authority to our hotel. Holiday Inn, Carteret, New Jersey. 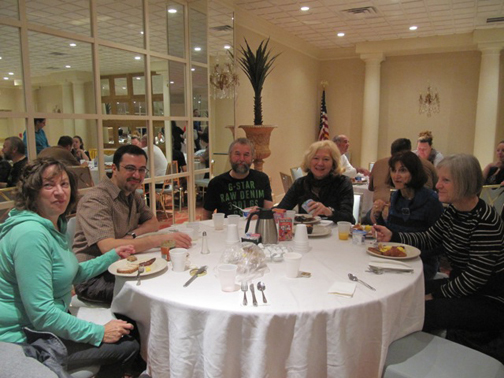 Next morning, at breakfast, we reconnected as a group while munching pancakes and scrambled eggs. Everyone had their own agendas, whether it was the Empire State Building, the Guggenheim, the MoMA, or another art destination. Diego and I hopped on the A train to 190th Street. 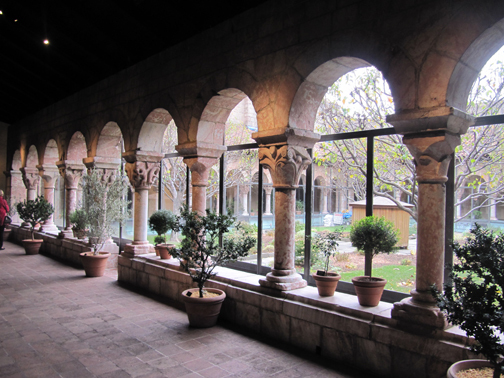 After a breathtaking walk through Fort Tyron Park, overlooking the Hudson River, we visited the Cloisters, the medieval collection of the Metropolitan Museum. The highlight of this visit was Janet Cardieff’s sound installation, The Forty Part Motet. Listening to the polyphonic choral effect of the voices streaming out of the high-fidelity speakers in the chapel alongside other mesmerized listeners was a profoundly earth-shaking experience. I also loved the room with the unicorn tapestries. 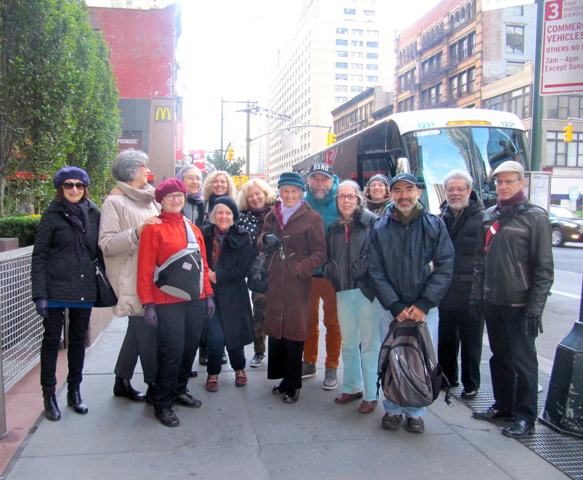 After an invigorating walk on the High Line, Diego and I met seven fellow travellers in Chelsea for a guided gallery tour. Rafael Risemburg, founder and director of New York Gallery Tours, took us to seven hot exhibits in Chelsea. He had a record-breaking attendance of close to 80 people joining this tour. As daunting as that sounds, it was a pleasurable and enriching experience. Rafael’s college-professor-trained voice projected very well in the large galleries. 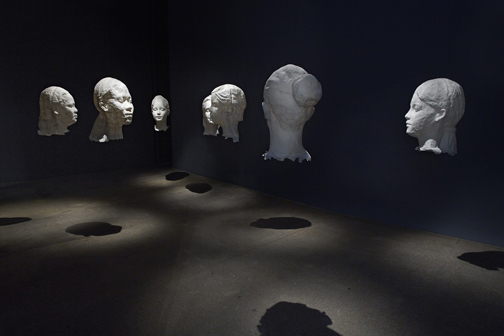 My favorite show was Jaume Plensa at Lelong Gallery and many from our group oohed and aahed over Richard Serra’s monumental sculpture at Gagosian Gallery. Diego and I topped the night off with supper in Chinatown with Ann and Judith, followed by icy ice cream in glittery, chilly midtown before catching the 10:00 p.m.Touika bus back to the hotel. All too soon it was our last breakfast. Besides Ann, who had faithfully worked out in the hotel gym at 5:30 every morning, most of us admitted to being a tad tired, while maintaining a high level of enthusiasm. The best line of the trip came from Sergei: “My feet feel like the feet in Picasso’s paintings.” Nevertheless, everyone had ambitious plans for the morning. 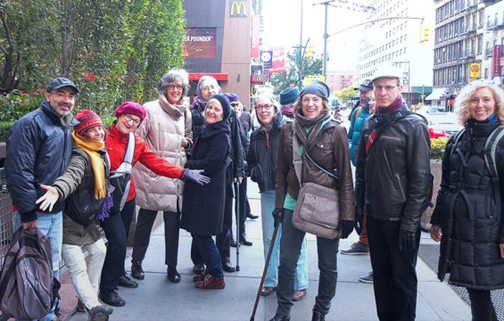 Many of us got off the Tourika bus at Central park. 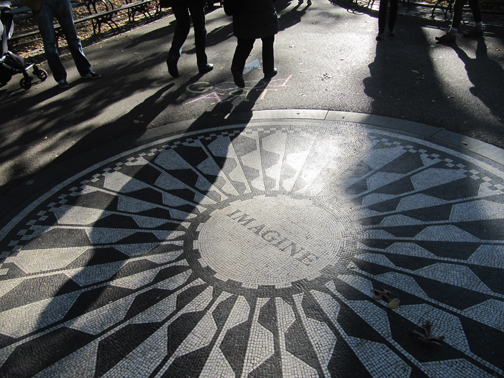 Finally after countless visits to the park, I saw Strawberry Fields, the 2.5 acre area that pays tribute to John Lennon. There was even a guitarist strumming Imagine, despite the sign that declares SILENCE as one of the many rules in this Garden of Peace. Everyone magically vanished to their destinations while Diego and I headed to the Met to see the Bathus show. I also saw Interwoven Globe: The Worldwide Textile trade, 1500-1800. This is truly an outstanding exhibit. Also, in keeping with Print Week activities, I saw Artists and Amateurs: Etching in Eighteenth Century France. At 1:00 p.m. we all boarded the bus for Montreal. Everyone agreed, this was an incredible trip. It was heart-warming to witness the camaraderie within the group. We spend so much time working side by side each other that it was refreshing to play together, especially in one of the all-time best playgrounds for artists. Last photo by Carlos Calado, merci! 40 requêtes. 0, 100 secondes.